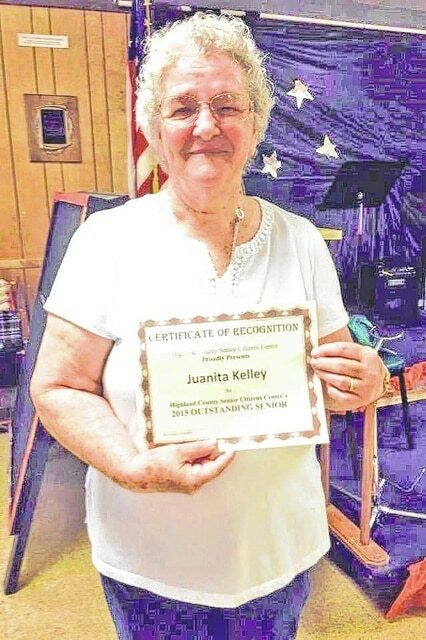 Voted by membership of the center, Juanita Kelley was selected as Highland County Senior Citizens Center’s 2015 Outstanding Senior. Kelley was presented with the award at WSRW’s Senior Expo, which is annually held at the senior center. Kelley volunteers for numerous events and activities at the center along with helping with the lunch line every day. She and her husband, Howard, have been active members of the center for 15 years. She enjoys many things at the center such as the music, games and volunteering, but most of all the she enjoys the people and the many friends she has made at the center.